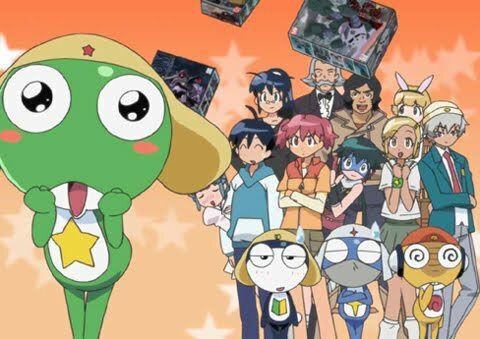 Keroro Gunso is the leader of an advance troop of alien invaders. They come from planet Keron and resemble giant frogs. They’re also pretty cute for being alien invaders. By chance, Keroro is discovered by members of the Hinata household and taken prisoner. They take his kero ball! Leave the frog some dignity! He escapes to continue the invasion of Earth (Pokopen), but he’s soon abandoned by his fleet. Basically, he and his troop become common household maids. I love to watch this anime so much! It is really good! It is suitable for kids to watch this cartoon. Cute frogs' characters! It's popular for the teenagers and adults too! because it's very hit in Japan. In year 2005, Keroro Gunso Anime won the 50th Shogakukan Manga Award for children’s manga! Keroro Gunso is also known as Sergeant Keroro in English. 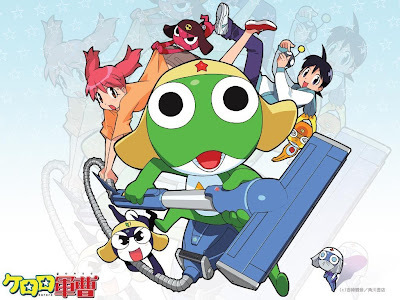 I enjoy to see about Keroro and his team crazy about do something which he get good idea when they want to invade Earth, but he always bring trouble to everyone in Hinata's house! Funny he is very scare of Natsumi! :D Keroro force to become maid when he cleans house! When he is free, he love to reading manga or building Gundam models. That is why it get more comedy, like physical humor, situational humor, dan numerous pop culture references (seperti Gundam, Space Battleship Yamato, dan Neon Genesis Evangelion). Keroro Gunso get the five members only; Sergeant Keroro is the leader, Private 2nd Class Tamama is his loyal suboordinate, Corporal Giroro is the combat specialist, Sergeant Major Kururu the tech whiz, and Lance Corporal Dororo the ninja assassin. Which is your favourite character? :D Not about Keroro's team, there are get weird characters; Angol Mois, Momoko, Koyaki and Saburo too. We can get to know more about Keroro's planet. For example, if Keroro absorb alot of humidity when he is in water...So, he will become uncontrollable and crazy to attack! He is very strong! That is why Keroro Gunso is an enjoyably so funny! Can the invasion continue or will Keroro be stuck doing the household chores for the rest of his life? What happened to the rest of Keroro Gunsou's team?